As new research shows the role the media coverage has played in fuelling misconceptions about the FARC and paramilitaries in the Colombian conflict, Oli Pritchard speaks to Alexandra García who carried out the investigation. Depending on how much Spanish-language media you read, you may have seen a recent link on social media and on most of the major news sites called “De por qué odiamos a las FARC (y no tanto a los paras).” Loosely translated it means “On why we hate the FARC (and not so much the paramilitaries)”, and it’s based on the work of exceptional researcher, Doctor Alexandra García. It’s important to remember the basic facts in Colombia amid all the contradictory proclamations. The paramilitaries and government (let us not forget the falsos positivos) accounted for many more victims than the guerilla. This is deeply at odds with the views of most Colombians, who are five times more likely to blame the FARC than experts do. Why, then, do experts, victims, regular Colombians and victims’ rights groups have such vastly different perspectives? One reason, highlighted by García, is the words the used in the media. Her research looks at hundreds of news clippings to evaluate the terms with which the Colombian media described the conflict from 1998-2006. What she discovered was astonishing in its scale, although hardly surprising to most well-informed observers. The main thrust of García’s work concerns the contrast between the perception and reality when it comes to the FARC and the paramilitaries. As she points out, in 2002, Colombia elected a president that offered a very generous peace deal to the AUC without triggering mass protests or a national debate. Even more significant, of course, was the president’s name – Álvaro Uribe. In fact, the very nature of media reporting changed during the period of his presidency. Between 2002 and 2006 media coverage of the conflict became even less impartial. A large number of headlines illustrate the point – where the FARC are actively named and indeed blamed, but when it comes to paramilitary violence, the actors are usually described in unclear terms such as ‘killers’, ‘people in hoods’, ‘armed men’ and so on. 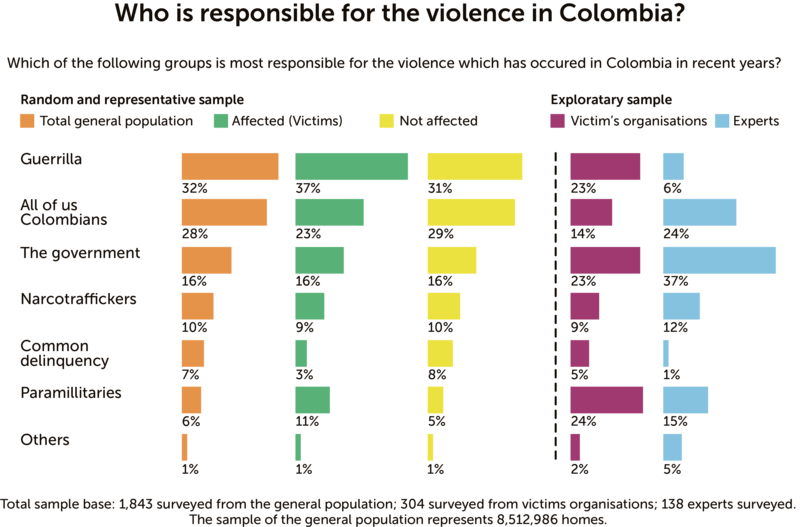 It is striking to see that when the verb asesinar is used to describe atrocities linked to each group, the FARC are identified as the actors 60% of the time, whereas the paramilitaries just 25%. It is striking to see that when the verb asesinar is used to describe atrocities linked to each group, the FARC are identified as the actors 60% of the time, whereas the paramilitaries just 25%. Even when the paras are identified as the guilty party, they are 5 times more likely to have modifying expressions such as ‘maybe’ or ‘allegedly’ added to the report. Furthermore, FARC actions were much more regularly described using words like ‘brutal’, or with gory descriptions of the violence. It’s a question that rings true. That demobilisation (note the language, it’s not a peace process) was quick and still has a number of unresolved issues hanging over it. Alexandra thinks that it wasn’t fear of speaking out that affected her students, it was a lack of awareness. She explained that the labels given to the groups plays a big part in influencing perceptions. “They would think they were the same thing, or that [the paramilitaries] were protecting the people from the abuses of the guerrilla. But statistics show that they were rare, fights between the guerrilla and paras. What they did was displace populations and carry out massacres. When they did come into conflict with the guerrilla it was usually the guerrilla engaging them in combat. She remembers talking to her thesis supervisor as she realised this type of thinking had become normal. She points to the example, ‘Another massacre by the autodefensas’ and says: “If they are self-defence groups, how can they be carrying out massacres? Just in that headline you see the contradiction. But it’s a very powerful thing. If you refer to people as self defence groups then people will start believing that they really are.” And on the other side, she says, the FARC are rarely referred to by their full name. Dropping down to the acronym obscures the part about revolution, the fact that they have an actual political position. And when reporting the same when committed by the FARC. Alexandra agrees with the many political commentators who now talk about echo chambers. Furthermore, it’s becoming more and more common to dismiss contradictory evidence. It’s one of the reasons her research is so important because the media plays a significant part in shaping people’s perceptions. “When people have made up their minds, it’s hard to change them,” she said. We had a peace process with the paramilitaries, where there hasn’t been justice, there hasn’t been reparations, there hasn’t been any of that. How can we do one thing, but not the other? 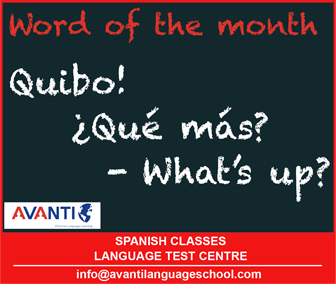 That was my question. Looking to the future, Alexandra is positive. She believes in peace and says that although she has reservations about Santos, she believes that he can deliver peace. “It is possible, because ideologies are resistant to change, but they can be changed. It depends on how we educate our children, and how we educate ourselves. The thing is, we need to see each other as equals. If we don’t, then we can kill them [the ‘Other’]. And that’s the role of the paramilitaries, they are the hitman, the black hand of the elites to stop whatever challenges them or the status quo.” It is clear that Colombia has much to do in order to deliver peace. Signing a peace deal is one thing, changing a culture and a media is quite another. One reason the FARC is the target of the bulk of negative feelings from Colombians is that for decades it claimed to be a force for peace, justice and altruism. So when Colombians see that the FRAC acts with brutality, killings and injustice, they are deeply offended. The violence and savagery from the paramilitaries is less hidden. They are often proud criminals and narcos with no consideration for human life. I suppose the paras are less hipotricial than the FARC but, yes, responsible for more atrocities if you want to put it in stats.